Weight transfer is one of the most important parts of the golf swing transition. To visualize what you need understand about weight transfer, you need to consider these key golf downswing points. 1. 80% of your weigh should be under your lead heal and ankle and 20% should be on your back foot withe the heal rolled in. 2. Hips should be open about 35 to 45 degrees. 3. Your shoulder line should be square 4. The final and most critical checkpoint is the position of the lead side of your body. Make sure you lead shoulder, hip, knee and ankle are all in line and "stacked" at impact. We call this neutral joint alignment. When you look for weight transfer faults in your golf swing, we normally see that many golfers just shift their hips and pelvis. This causes too much secondary axis tilt which creates inconsistent contact points. The second main fault we see is that other golfers fall forward onto their front foot. This is a poor move because your body gets to far infront of the golf swing. The perfect drill to use in order to fix both golf weight shift problems is to think about a baseball pitcher. If you look at the longest hitters on the PGA tour, you can watch them use their legs (just like a pitcher) to shift and drive through the golf swing. A second drill that is great for weight transfer is to take your front leg and drag it forward along the ground. Once you do this for 15 reps and get the feeling of forward weight transfer, you can use the muscles engaged in the "throwing motion" drill to dynamically drive throught to your front side. Remember: always focus on acheiving neutral joint alignment in order to achieve the perfect impact postion to compliment your weight transfer. Today we're going to be discussing one of the most important parts of down swing transition, and that is weight transfer in the golf swing. I'm going to be showing you what some of the common faults, that you may be struggling with in your own golf swing. And more importantly, I'm going to be giving you a detailed list of check points that you're gonna start to look for when starting to refine your down swing and your weight transfer. So if you've been battling with weight transfer, pay close attention to today's video. Let's go ahead and get started. Okay, so in part one of this video I think it's extremely important for all of us to have a clear understanding of where we're trying to go in our down swing first. So that we have a good visualization of what we're gong to be trying to achieve. And I'm going to go ahead and demonstrate an impact position and give you a few check points of what you're going to be looking for when you start to work through these drills at the end of the video. Let me go ahead and impact this bag here. I'm going to hit it lightly. So here are my check points for you. Forget about the hands and the arms at this point. Forget about the lead wrist, we're just going to be looking at the body lines for now. What I want you to focus on is making sure that, number one, you have 80% of your weight in your lead leg underneath your lead ankle, lead heel area. So 80% of my weight is going to be right underneath my lead heel, lead ankle. 20% of my weight is going to be over on my trail foot. So 20% of my weight is going to into this right side. With the foot rolled in. No heel up off the ground. Okay, so we want to have 20% of our weight, heel down. You can see that my heel is rolled in here. So your first check point, 80% 20%. Second check point, is your hips should be opened about 35-45 degrees. Okay, so from down the line hips should be open about 35-45 degrees. Your shoulder line should be square. So when I shift over, I've got 80% 20%, hips opened about 35-45 degrees, my shoulders are square. So down the line what that looks like. Our head should still be in behind the golf ball. So when I hit this impact bag you can probably see that my head stayed back there. Now, the final most critical check point of it all that's really going to dictate a lot of the faults that you probably have in your golf swing, is the position of the lead side of the body. So when we're at impact here, we want to have our lead shoulder, our lead hip socket, our lean knee and our lead ankle all stacked right on top of each other. This is what we would call neutral joint alignment. This is a perfect impact position. This is going to allow you to control the bottom of the swing arch and get the club to bottom out in the same spot every single time which is really critical for consistent ball striking. Okay, so now in part two of this video I want to go ahead and discuss some of the common faults. And one of the biggest faults that we see is when people start to work on shifting their weight. That's the operative word is, we're going to shift our weight over to our lead side. We're going to use our legs. What we typically see, okay so I'm going to get he club out of here for this so I can demonstrate if properly. Is when you load in to your right side, we see people just shifting their pelvis and keeping their upper body back. Now, we would all agree that when we load into our right side, we shift and we turn our body. So we've moved off the golf ball in essence here. Maybe an inch, inch and a half or so. We need to allow the upper body to move dynamically back over to your lead side. So if I were loaded into my right side here, I wouldn't just want to shift my hips. What that's gonna do, is it's going to create a lot of secondary access tilt which can in turn shallow your swing plane. So if I were at the top of my swing, and I lean my spine away, you can see that the shaft plane lies very flat. Also, the problems with just shifting your hips laterally, is that you're still bracing a ton of weight into your right side. You haven't moved, or you haven't transferred that weight over to your lead side. So you need to allow the upper body to feel like it's moving. Now golfers, or armature golfers, tend to feel like this is a big slide. This is not a slide by any means. You can allow your body to move if you've loaded your right side properly. So if I load here and I'm moving back over to the left side, we can allow things to move back over. We're still wanting the body to move. If you've been seeing on camera that you're getting a lot of secondary access tilt in transition then these drills later in the video are really going to help you out. Okay, so the second most common mistake that we see is a fault when working on downswing transition or transferring your weight properly over to your lead side as what we call a closed hip slide. So if you've noticed yourself on camera or maybe you've been working with an instructor through the swing review process and they've talked to you about this closed hip slide. I want to go ahead and define what that means for those of you that don't know. From a down the line perspective, when I'm loaded into my right side here. Okay, for me to move my weight over to my left side, what a closed hip slide would look like is just kind of falling over to your left foot without your hips unwinding at all. So from a face on perspective, you're loaded into this right side, let me do this properly here. And then you would just fall over into that left side. That is a very, very difficult move to recover from because now, as your weight shifts or falls over into that left foot, you have to remember your hands and arms are starting down very, very quickly. Now for you to be able to transfer the weight from the toes, or the ball, of your foot all the way back to your heel and your ankle joint and then open your hips up before you hands and arms get down to the hitting area is very, very difficult to do. Also, you run the risk of when you're doing this closed hip slide, of getting your body out front of the golf shot. So again, the two common faults are, is here A, is just shifting our pelvis and now allowing our torso to move back along with the lower half or B, a closed hip slide. And I've got a great drill that's going to help you overcome both of these swing faults and it's going to help you get into that perfect impact position. Just like we had in part one of the video. So now let's get to work on proper weight transfer in your golf swing so that you get a clear understanding of how you're going to be moving properly from the top of the golf swing down into impact. And what I want you to think about, is a baseball pitcher. How would a baseball pitcher start his move? Well, you would see him transfer his weight, okay, you would see him lift his lead leg up and then you would see him make an external rotation of his lead leg. This is actually called internal hip rotation here. You would see this move where he rotated his leg outward, okay. So again, you'd see this move. Then he would pivot his hips and then he would fire his arm. So you can see how there's a chain of events that's being driven by the lower half down here. Now that same move, is actually happening in the golf swing, believe it or not. Watch some of the longer hitters out there. You're going to see their first move from the top of their golf swing down, is you'll see their leg start to make that same sort of external rotation, or again, internal hip rotation here. So my point here is, is what I want you to do in order to be able to encompass this, is just try throwing a ball first. Pick your leg up, plant, okay. Do this several reps over. You're going to feel what it's like to use your legs in that same sense. Once you get more proficient at it, you're going to feel like you're keeping your foot completely on the ground. You're going to feel like you're still making that same move. Now, there's also another drill that you can encompass with this. And this is a drill that I put out in the hip pain video. The preventing hip pain video. So for those of you that have very little awareness of the leg muscles that we want to use to help pull yourself back over to your left side. Now that's a really big work around rotary swing, is push verses pull. We want to be able to pull ourself back over to that lead side. So for those of you that have very little awareness of those muscles, what I want you to do is I want you to take your lead leg. Okay, your lead foot, I want you to drag it on the ground. Okay, I want you to do this many six or seven times here. Okay, drag it on the ground or your carpet at home. You're going to start to feel some muscles contract in your leg here. Once you start to feel those muscles, now what I want you to do is I want you to keep your weight on your right side and I want you to wind your hips up. You're going to keep your foot kind of rolled in on your lead foot here. It's going to look a little goofy because I'm not in golf posture but you're going to see now, I'm going to keep this foot planted and I'm going to pull myself over to my left side. So I've done the baseball motion a few times. I'm starting to feel what that's like. I've dragged my foot on the ground. Now I'm going to get myself set up. I'm going to wind into my right leg here, and now I'm going to use those muscles and that throwing motion with my left leg to pull myself over. And because I'm focused on my lower body doing all the work. Watch what my upper half does. See how my upper half is now moving dynamically back over to the lead side? If you use your leg muscles from the lead side of your body and you're pulling, your upper body will want to move with it. If you're pushing from the right side, or not using those muscles at all, that's when you're going to run into those faults. So I want you to try this drill out. Let's go ahead and do a perfect now. Load up, I'm going to make sure that my leg feels like it's externally rotating, I'm going to use those leg muscles, and then we're going right into neutral joint alignment where our knee, our hip, our ankle, and our shoulder are stacked right on top of each other. Once you become more proficient at this, start adding the golf club back to the mix. Use an impact bag. But flip the club over. You're going to work to the top of your swing. You're going to use those leg muscles and you're going to start to feel yourself getting pulled into your lead side so you're ready to post up and really ready to release. And you're going to be in a great impact position with proper weight distribution and proper impact position. 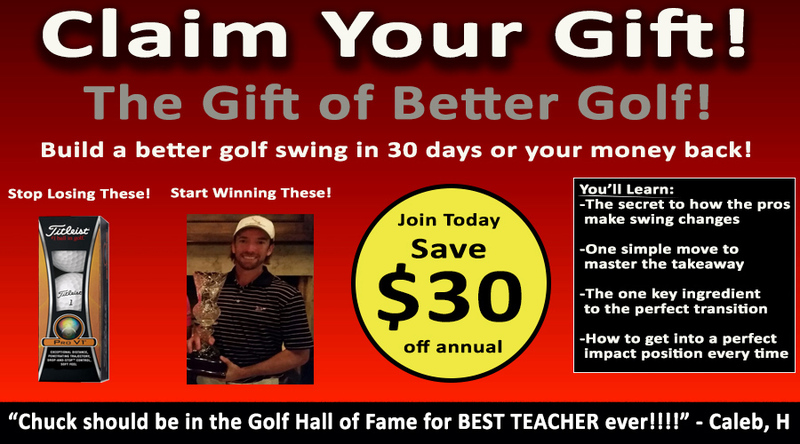 Get Your Free Membership to Finish Watching "Fixing Your Weight Transfer in the Golf Swing" Right Now!